Strolling along Greens’ small homey garden into its alcove, one’s senses is pleasantly enveloped by the colorful atmosphere. We immediately felt at home! Greens has been operational for more than 5 years now but they just moved the restaurant to the Duran’s residence about a year or so (not sure about this). Some carnivores won’t even put this vegetarian resto into their dining consideration set. But not for this struggling vegetarian, who have been recently seduced again to the dark side of meat+carbo diet (the worse combination), Greens was a taste of heaven and a taste of live food. We decided to eat here for a family birthday celebration of my wife’s birthday and brother-in-law. At first, we were not sure if the other members of my wife’s family would like it here but images of Latasia fusion vegetarian food or 85/15 cuisine at The Farm @ San Benito, convinced me that we should take the risk and eat healthy food for a change even for just one Sunday afternoon. 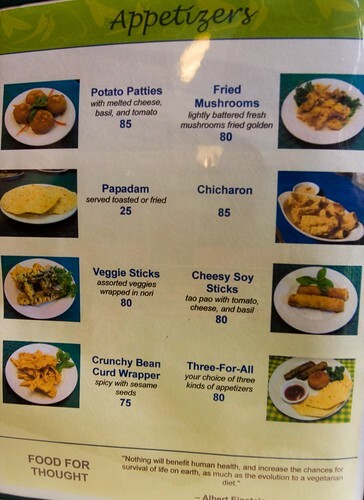 Also, some of my readers have constantly suggested this vegetarian place after my feature on Latasia Fusion. It was a hit! 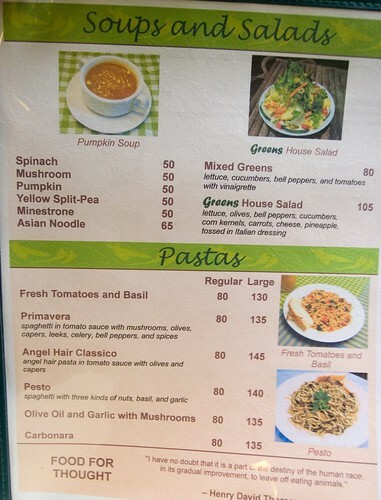 Greens vegetarian food cleverly imitates its dead/ unhealthy meat versions, which makes it palatable to ordinary filipinos even those who are not used to 100% vegetarian meal. The homey ambiance is conducive for family lunch and dinners and we were able to get our privacy for a group as big as 12+. I like it for its vegetarian innovations. They were able to cook glutten (substitute for meat) to have a texture and appearance of meat. It is usually accompanied by an overpowering sweet sauce which I think is too sweet for my taste. 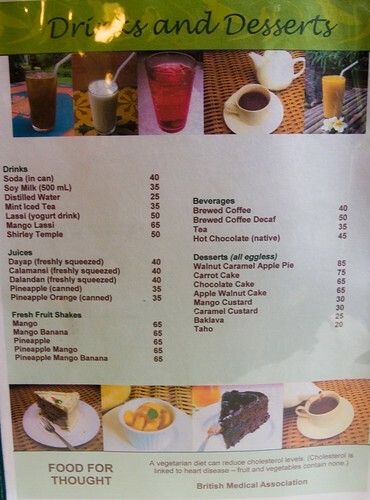 We were able to order a wide variety of vegetarian food items and the entire family was satisfied with the experience. This simple counter setup will greet you as you enter the main door. It has a sari-sari store type of display for selling vegetarian products both finished products as well as raw ingredients. We were able to reserve this small section for a Sunday family lunch. There are quite a few followers already for Greens and we need to support these kinds of vegetarian restaurants. After all, our health is the concern here. 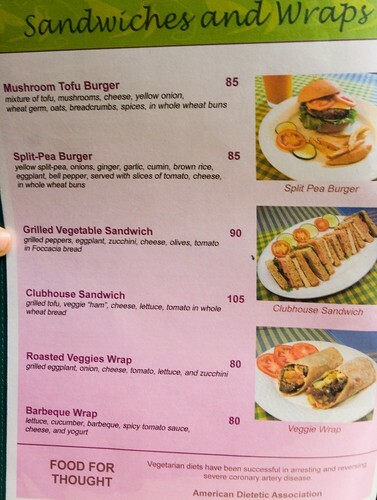 The GREENS Menu — Here is the menu if you decide to check out Greens. Chicharon (P85). I love this vegie chicharon version made up of Tofu cooked in corn oil. Veggie Sticks (P80) Assorted veggies wrapped in nori. Plates of these sticks just kept on coming. Need i say more? Munching away without its red sauce was the way we liked it. If you like seaweed, then you would love these vegie sticks. Pumpkin Soup (P50) Would you like it with cream or just as plain jane? If you’re as healthy as you would like to think, then have it without the cream but if you are like one of us, loving cream based soups, then have it with a dollop of cream… Just a caution, when you order pumpkin soup here, literally, it would really taste like a pumpkin in a liquified version (with a hint of ginger) which is in fact good for your health. I would think that almost all of their soup with be prepared in a similar way so good luck! Eggplant Parmagiana. This taste like your usual home-made eggplant with cheese. As usual, the cheese was the one who carried this dish. Grilled Mushroom and Tofu Kebabs (P105) Marinated fresh button mushrooms and tofu, red and green bell peppers, zucchini and shallots. We were not able to taste this but just by the looks of it, are you sure it is 100% vegetarian? Olive Oil with Garlic and Mushroom, Large (P135). Just a dash of fresh pepper and I think this would do. Next dish please! As you can see, I’m not to excited about their pastas. Roasted Veggie Wrap (P80) Refreshingly fresh with doused with a sweet tasting sauce. One healthy dish to add to your set of meal. 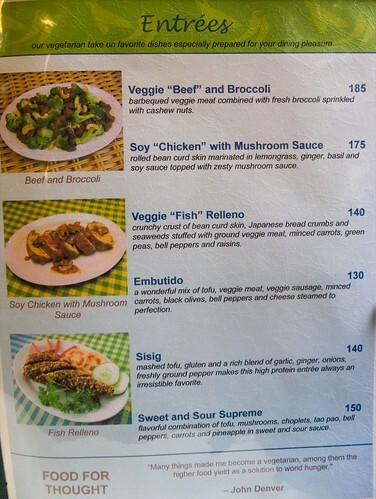 Veggie Beef Broccoli (P185). The sauce is just too sweet for me. It seems that they are trying to mask the taste of the glutten with an over-powering sauce. Primavera, Large (P135) spaghetti in tomato sauce with mushrooms, olives, capers, leeks, celery, bell peppers, and spices. i like its mixture of sweetness and tomato taste. I could just imagine the serving of the small one because this large order is only good for one person. 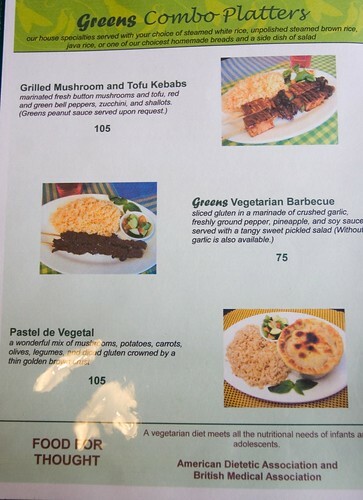 Greens Vegetarian Barbeque Combo Platters (P80) . sliced gluten in a marinade of crushed garlic, freshly ground pepper, pineapple, and soy sauce served with a tangy sweet pickled salad. These barbeque are worth the P80! I can remember that this costs the same as the Jun-Jun’s Barbeque of Pampanga which is P40/ stick. Since it looks like the real barbeque, it somehow fools your brain that you are eating barbeque so this is also a hit for us. My son Aidan took a bite and took a liking of it but again, it’s too sweet for my tastebuds. Sisig (P140) mashed tofu, gluten and a rich blend of garlic, ginger, onions freshly ground pepper makes this high protein entree always an irresistable favorite. The bestseller in the house. Now, they got this right to the “T”. Tastes fabulously like the real thing!!! We ordered a lot of these Tofu based sisig which is crunchy and spicy hot. Mooncake Dice Game In keeping with the traditions of my wife’s Chinese culture, we played the Mooncake dice game. It was my first time to play it with the family ever since we got married. Aidan loved rolling the dice by himself, throwing the dice into the bowl with glee! And guess who amongst the 3 of us got the better prize? Of course, it is my lucky son Aidan. On his first try, he got 1-2-3-4-5-6!! SAVING TIP: A word of advice to those credit card lovers out there who are planning to eat here, bring C-A-S-H! Although they honor your credit cards, an additional 6% will be added to your bill. 6% is still something so if you still want to lower your cost, bring cash! Of course this is all just legalese. If Greens were to increase all their prices by 6% and offer a 6% discount for cash payments, and no discount for card payments — that *would* be allowed. so happy to hear about this! i’m slowy trying to “vegetarianize” my palate. thanks for the heads up! great read anton! food looked good and i was dying to try the restaurant. until you mentioned the 6% surcharge. not only is this a turn-off for me, but i strongly feel that any establishment that practices this does not deserve my business. i’d rather spend my hard-earned pesos somewhere else. My fear with veggie food is it compensates everything with MSG. Bodhi is very guilty of that. Did the food leave you wanting drink loads of H20? Cathy B: Hard to say. I drink lots of water whenever and wherever I eat. Yup, MSG overload in the Bodhi restaurant. None in Greens, if my tongue recalls correctly. the food was awesome!!! and the tofu sisig was even better than the meat version!!! Hmmm… I’m no vegan but I like vege foods. The food shots look yummy! I’ve tried Bodhi several times including the ones in Ortigas when it was still open (closed already). The taste is ok but what I don’t like about their food is its oily and yes, they put lots if not loads of MSG. I always feel thirsty and my nape feels numb every time I ate there. Their main branch is in Banawe corner Del Monte in Quezon City. hypocrites, i think, … vegetarian and trying to serve it like meat. what are you fooling yourself? Wow Joma. What intolerance eh? Are people not allowed to stick to their principles (advocacy or health-wise) and live the way they want? It doesn’t mean that people have to completely let go off their favorite food just because they choose to go vegan. They compromise according to their health/advocacy principles. Really best to just respect other people’s choices and not accuse them of hypocrisy. It’d be a much better world that way.